A terrible year, a miserable day, and a Christmas legend in the City of Brotherly Love. Frank Olivo in his Santa suit, cheering on the Eagles at Franklin Field. 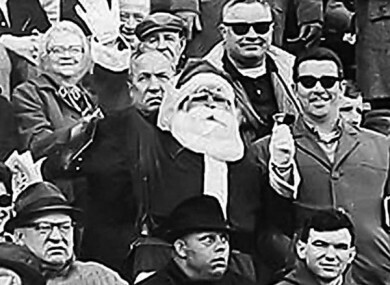 ON A HORRIBLE winter day in 1968, a stadium full of angry Philadelphians broke the ultimate Christmas rule. They attacked Santa Claus, and gave birth to a legend. At the old Franklin Field, on 15 December, the Philadelphia Eagles were hosting the Minnesota Vikings for the last game of the regular NFL season. Some 55,000 people had bought tickets, but not nearly that many actually showed up. There had been a blizzard, and the temperature that day was down to -9 degrees celsius, factoring in the wind. The loyal fans who did turn out were treated to seats covered in inches of snow, and a fairly dire first half, with just one touchdown each for the Eagles and Vikings. Aside from the miserable set of circumstances that day, Philadelphia sports fans have always had a reputation – whether fair or not – as rowdy and cantankerous. As far back as 1949, the Phillies baseball team had to forfeit a game against the New York Giants, when a controversial decision by the umpires provoked a barrage of glass bottles and tomatoes from the stands. In 1972, fans of the Flyers ice hockey team left a rival coach needing 12 stitches, after attacking him and his St Louis Blues squad during the game. In 1997, things got so bad that a specially dedicated court and jail cell was set up inside Veterans’ Stadium, then home to the Eagles. And in 1968, Eagles supporters had more reasons than ever to be angry. Joe Kuharich was as unpopular a coach as Philadelphia has ever seen, but was four years into an extraordinary 15-year contract given to him by the team’s owners. Going into the last three fixtures of the season, the Eagles had lost all 11 games. If they lost the rest, they would be without doubt the worst team in the country, but with an important consolation. Given how the NFL draft works, the Eagles, as the team with the worst record, were set to have first pick the following year, with a much-vaunted running back named OJ Simpson expected to be chosen first. However, they won two in a row in November and December, and gave up their “perfect record,” before they even took to the pitch on 15 December. Right at the point where you’re happy that they’re losing games, they start to win games. Now the season is truly a total loss. Because now…you’re not the worst team, which is what you wanted to be. You’re just a bad team. Still though, how awful could it be? It was just 10 days from Christmas, and Eagles management had planned their special annual pageant for half time, to bring some seasonal cheer to the stands. The plan was for the Eagles cheerleaders, dressed as elves, to form a column while Santa Claus rode a sleigh through it. But the pitch, covered in snow and cut up by the first half’s play, had turned into a mudbath, and the sleigh got stuck before it even properly made it out. And then, nobody could find Santa himself. Some reports had it that the actor hired to portray the big man got snowed in and didn’t risk the journey to Franklin Field, but there was also a rumour that he had over-indulged that day, and was in no fit state to put on the suit. Either way, someone in charge of the pageant spotted a man in a Santa suit in the crowd, and asked him to help out. 19-year-old Frank Olivo, a diehard Eagles fan and season ticket-holder, wore the suit on the last day of every season, and agreed to do his bit for the team in 1968. Which he duly did. But the fans – sitting on wet, freezing seats, watching a terrible game unfold, and frustrated by the management of their beloved Eagles – were in no mood for it. I said, well you know, I understand what’s going on here. They’re not booing me, they’re just booing Santa Claus – they’re booing everything. Santa had it coming for a different reason…Santa was a surrogate that day for [the coach and the owner]… The poor kid just happened to be representing the frustrations. Then, as soon as he was in range, fans from around the stadium pelted a “tsunami” of snowballs at him. For his troubles, Frank Olivo got a thank you letter from the Eagles, along with a pair of cuff-links. The incident was picked up by the national media the next day, and a legend was born. Before the start of the following season, Eagles owner Jerry Wolman sold the franchise, and coach Joe Kuharich, despised by fans, was sacked. In the 1969 draft, the Buffalo Bills, with the worst record in the country, picked OJ Simpson, who went on to have a record-breaking career with them. The Eagles moved from Franklin Field to Veterans’ Stadium three years later, where they stayed until 2003. Frank Olivo, who worked as a barber and in the casinos of Atlantic City, kept the Santa suit for four decades, and remained a fiercely loyal Eagles fan. He died in April, at the age of 66. He is indelibly etched in Philadelphia sports history. For as long as there is professional football, the story of the Eagles fans pelting Santa Claus will always be told. Email “The legend of Frank Olivo, and the day they threw snowballs at Santa Claus”. Feedback on “The legend of Frank Olivo, and the day they threw snowballs at Santa Claus”.